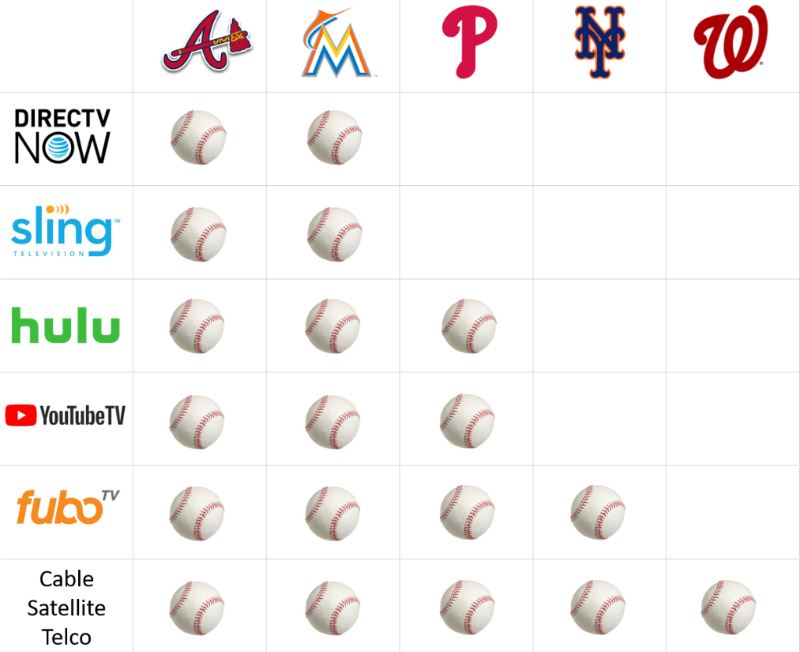 This week, with spring in the air, we're talking about baseball -- or, more specifically, how the complicated web of RSN distribution makes it harder for baseball fans to know their subscription options. As baseball's Opening Day approached, sports-oriented OTT provider, fuboTV, made news by adding SNY, home of the New York Mets, to its local lineup. With more video providers on the scene, consumers can be forgiven for being confused about where they can find the home team on TV. Carriage of RSNs vary. Telogical monitors channel lineups and cross-references content availability to better understand the competitive landscape. In the example below, we focused on the National League East division. Fox Sports South, Fox Sports Florida, NBC Sports Philadelphia, SNY, and MASN are the must-have networks from Atlanta to Washington, DC. Sports programming remains the linear TV tent pole. No one "binge watches" a 162-game regular season of baseball. Some consumers justify piracy when they feel there are no good options. The absence of alternatives for in-market viewing of the Washington Nationals led a fan to justify his "not exactly the most 100 percent legal solution" for watching games without subscribing to traditional cable, satellite, or telco options. Exclusive distribution deals continue to pop up across the sports-watching landscape. Unintentionally, Spectrum SportsNet LA became "exclusive" to Spectrum customers, leaving Dodgers fans with no other options as that channel's distribution standoff stretches into its fifth season. Meanwhile, in a first for a streaming service, YouTube TV struck an (intentionally) exclusive deal with Major League Soccer's Los Angeles franchise for the rights to show its games in-market. Out-of-market viewing options are much easier for consumers to navigate than in-market. Whether it's DIRECTV's NFL Sunday Ticket (available to stream without a DTV subscription) or MLB.TV streaming choices, leagues have been finding ways to cash in on fan interest without undercutting teams' lucrative RSN affiliate fees. The Nationals will win the NL pennant this year. Okay, that's less "analysis" and more a hopeful fan cheering for his team. If you happen to be in DC, give me a shout-- I know a great ballpark to visit.